HAPPY OCTOBER! I love fall, it’s been my favorite season since I was a small child. I even ended up having my first born in October, so my favorite month became even more special. Now we can’t talk about October without talking about Halloween. 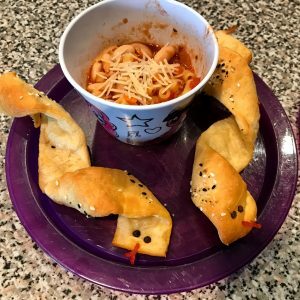 I always enjoy making a silly spooky dinner or snack for my kids before trick or treating or to put in their lunch boxes. I’ll be highlighting some fun past meals while also brainstorming for a new idea for this years Halloween. Preheat your oven to 350 degrees and line a baking sheet with parchment paper. Take your crescent dough (I find the “crescent sheet” to work best) and using a pizza cutter, cut long strips from your dough. 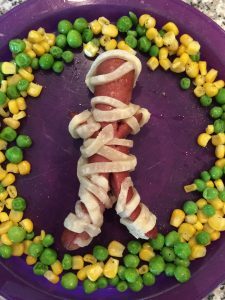 Wrap your hot dog in 3 or so long dough strips intertwining to look like a mummy. Bake 10-12 minutes or until dough is golden brown. Now time to decorate, given your child’s taste preferences you can give your mummy eyeballs. Either small dots of mustard or ketchup will work. Or if your eyeballs don’t turn out as you’re hoping (guilty as charged), then use those eyeballs as glue for new green eyeballs and stick peas onto your ketchup or mustard dots. 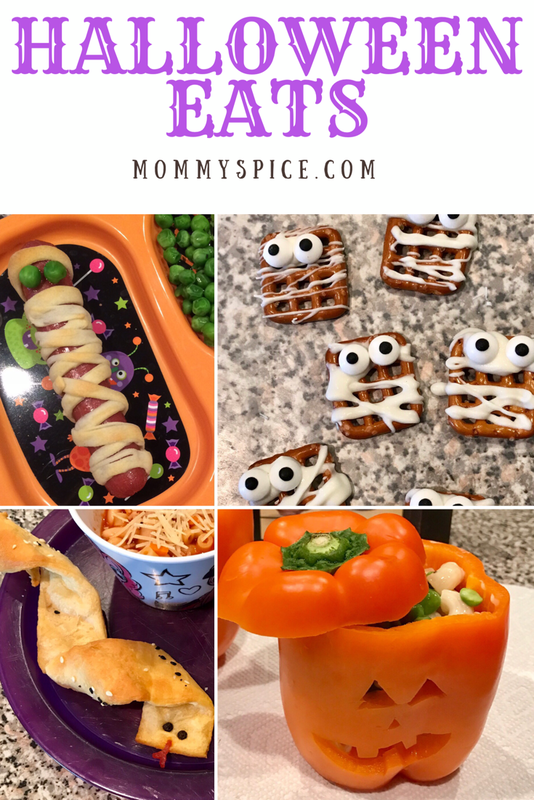 These were such a hit with my kiddos, very on theme with Halloween but also something very familiar that they are used to eating. These mummy dogs have a lot of wiggle room to make them your own. 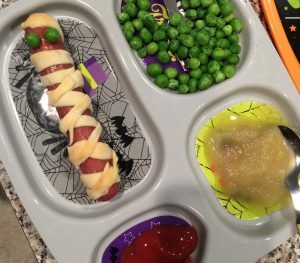 If you’re feeling fancy or have good knife skills you can cut little arms and legs out of your hot dog and wrap those as well for more of a real walking mummy look. You can always slice cheese into thin long strips to intertwine with the dough strips, this may make for a messier presentation but a yummy cheese dog. Have fun with these, and let the kids help. Dinner and a craft in one, a win-win! Filling of your choice, I did macaroni and cheese and peas. Wash and dry your bell peppers well. Next, cut off the top and scoop out the ribs and seeds, careful not to puncture the rest of the pepper. Now lay the pepper on its side, with the largest flattest side facing up to carve out your jack-o-lantern face. Using a small sharp knife cut out shapes (triangles/circles/squares) for the eyes and nose. Then cut out the shape of the mouth pressing slightly as you go. Rinse and dry peppers again inside and out. Then fill with whatever you desire. You could fill it was any pasta or rice dish, just nothing too liquid (like soup) that would spill through the jack-o-lantern face. I leave these peppers raw for filling, they keep their structural integrity that way and act more as a bowl. If your kids love raw bell peppers then this makes for a nice edible bowl. If your kiddo is not keen on raw peppers, simply rinse the jack-o-lantern when they’re done eating and dice up your “bowl” for another dish, such as Sloppy Joes or fajitas. I found carving these to be a little tricky, and very similar to carving actual jack-o-lanterns. 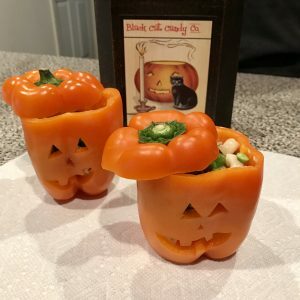 I went through a few bell peppers my first try so it’s best to try these before Halloween on any color pepper you are already buying to make another dinner. My tip for this one, pick out the peppers with 4 bumps on the bottom. This will make this more stable when the kids eat out of them. 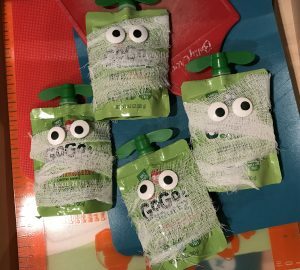 Cut your gauze into long strips, tape one end of the strip to the bottom back side of your apple sauce pouch. Now wrap it around as many times as you like, adding more gauze strips if desired. When finished add another piece of tape to the end of the gauze strip. Glue or tape on googly eyes and you’re done! 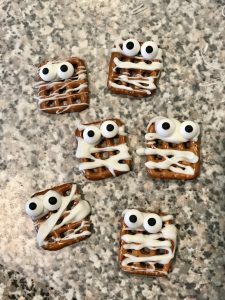 A cute lunch box treat or classroom snack to send in for Halloween. These are SO easy and a real kid pleaser. Again, taking something they know and love and just adding a little holiday magic to make it new and fun. This is another one that you can let the kids help make. 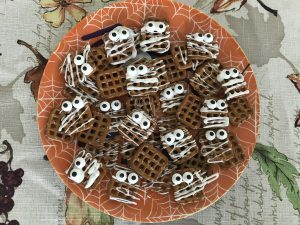 We love to make a big batch of these and send them into my kids classrooms for Halloween. Not to mention these are a nice healthy candy alternative. Lay out your pretzels flat into rows on top on wax paper. Heat up your melting chocolate until smooth. Next using a spoon, drizzle pretzels back and forth in the quick motion to give the effect of mummy strings. While the chocolate is still soft press edible eyeballs on and let pretzels harden and set. Seal in an air tight container for up to a week. These are SO good! We make candy quick covered pretzels for every event around here. Birthdays, Christmas, bake sale, New Years, you name it, we have a yummy pretzel treat to match it. They’re always a hit and we hardly ever have any left, I myself find the sweet and salty pretzel treats to be deliciously addictive. My tip for this one is to stock up on those edible eye balls and have some fun! Stick them on toast, or mashed potatoes, or make a snack mix and throw them inside. Why not, I mean what other time of year can you put eyes balls in your food and it’s acceptable? Preheat oven to 375 degrees and line a baking sheet with parchment paper. Next cut pieces of foil and roll/crinkle into rods. About a 1/2” thick and 4-5” long. Now roll out your crescent dough, again I find the sheets to work best. Cut strips about an inch wide using a pizza cutter. Next spray your foil rods with non stick spray and wrap your dough around the foil 1-2 times. Sprinkle with everything seasoning and bake 12-15 minutes or until golden brown. While the snakes cook, lay out your peppercorns and cut little tongues from pieces of pepperoni. Once snakes are done baking, immediately stick in eyeballs and tongues and let cool slightly (2-3 minutes). 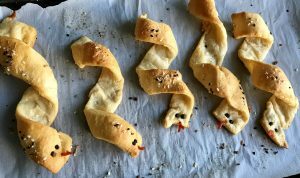 Gently pull the foil from one end of the snake and what you should be left with are these adorable little bread stick snakes. Eeek!! Anyone who knows me, knows that I’m terrified of snakes. I wasn’t even sure I could pull off this dinner, but I’m glad that I did. Soup and Snakes was a total hit! It was easy and super cute! My daughter even said “but you hate snakes? 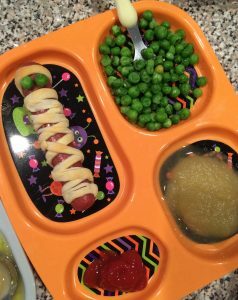 !” when I gave her this for dinner last Halloween. I found that cutting out the pepperoni tongues was honestly the most time consuming and hardest part of this whole meal. That being said you could definitely leave the tongues off and keep this super easy for yourself.